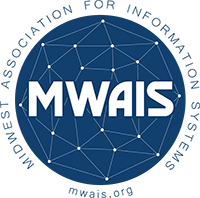 The Midwest United States Association for Information Systems (MWAIS) is a Chapter of the Association for Information Systems (AIS) serving Midwest US members of AIS. The states served by this Chapter include Illinois, Indiana, Iowa, Kansas, Michigan, Minnesota, Missouri, Nebraska, North Dakota, Ohio, Oklahoma, South Dakota, and Wisconsin. The goal of the Chapter is to promote the exchange of ideas, experiences, and knowledge among scholars and professionals in the Midwest US engaged in the development, management, and use of information and communications systems and technology. What is the goal of MWAIS? What are the AIS/MWAIS membership benefits? AIS/MWAIS members enjoy exclusive benefits, including: access to the AIS eLibrary, conferences, travel benefits, career services, and access to the membership community. For more information visit the AIS website. How do I join MWAIS? Membership in MWAIS is open to all. However to join MWAIS, you must first be a member of the Association for Information Systems. AIS offers 4 individual membership classes: Academic, Student, Retired, and Professional. For more information visit the AIS website. What are the AIS membership types? There are four types of membership: Academic, Student, Retired, and Professional. For more information visit the AIS website. Meet your MWAIS Executive Committee. Read JMWAIS, the chapter journal for MWAIS. Review minutes from MWAIS chapter meetings. Get MWAIS news and updates! Network with the MWAIS community.